Police officers at the scene of the crash. 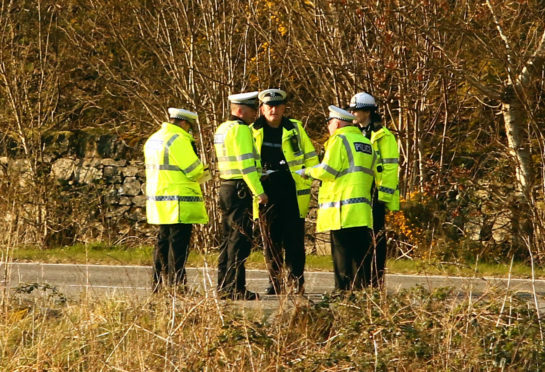 A 63-year-old man has been killed in a two vehicle road accident in Argyll. It happened at around 4.40pm yesterday on the A828 near Appin. The man, driving a Vauxhall Meriva, was pronounced dead at the scene. It is believed he may have taken ill at the wheel. The occupants of a Ford Ranger, two adults and two children, were treated at the scene, but they did not require hospital treatment.